Former Philadelphia Eagles defensive end Daniel Te'o-Nesheim has died at the age of 30. 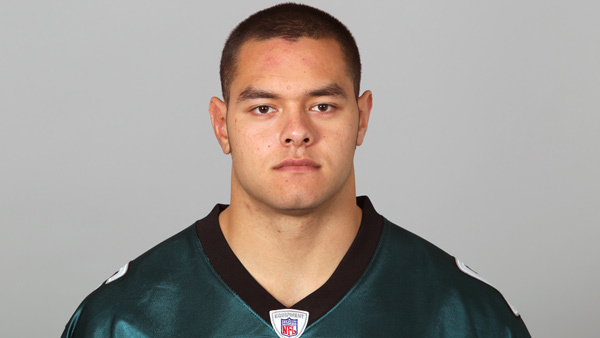 "The Eagles are saddened to learn of Daniel Te'o-Nesheim's passing. Our thoughts are with his family and friends," the Eagles tweeted Monday. Te'o-Nesheim was selected by the Eagles in the third round of the 2010 NFL Draft. He played in only six games with the Eagles. Te'o-Nesheim also played for the Tampa Bay Buccanneers, who expressed their thoughts on his passing also on Twitter. "We are saddened by the news of former Buc Daniel Te'o Nesheim's passing. Our heartfelt condolences go out to his family," the Buccanneers tweeted. Te'o-Nesheim is a native of American Samoa and played college football at the University of Washington. "All of Montlake mourns the loss of former Husky, Daniel Te'o-Nesheim. Deepest condolences to his friends and family," the UW Football Twitter account posted, along with a video tribute. All of Montlake mourns the loss of former Husky, Daniel Te'o-Nesheim. Te'o-Nesheim was the head coach at Hawai'i Preparatory Academy. In a statement to ABC affiliate KITV, the Academy said, "Hawai'i Preparatory Academy (HPA) was deeply saddened to learn of the passing of our friend, colleague, and alumnus Daniel Te'o-Nesheim... HPA is working to support our students and community through this difficult time. We feel Daniel's loss acutely in our HPA 'ohana, and our hearts go out to his family and friends." No further details of his passing have been released.